A Choctaw Response to Violence: Authenticity? We live in a historical moment where hatred and violence are promoted, not only by individuals and splinter groups, but also by governments. Is it possible that we can learn how to hold onto our true selves in such a moment? What’s more, can we learn about that kind of authenticity from Native Americans, who have had a few hundred years of practice at the receiving end of hatred and violence? Tim Tingle is a Choctaw storyteller and novelist, who I introduced in a previous article. I describe there how Choctaw culture, as portrayed in Tim’s work, models a sense of connection that is rare in our wider society. In this article, I turn to one of the ways in which Tim’s novels for teens and young adults—mostly written in the historical past—show us what it might mean to be authentic today. In Tim’s House of Purple Cedar, we meet Amafo (“Amafo” means “Grandfather” in Choctaw), a gentle, well-respected leader in his Choctaw town. Early in the novel, Amafo goes with his 11-year-old granddaughter to the neighboring town of Spiro, where the white people live. There, the town marshal, in a drunken rage and without provocation, bashes small, frail Amafo in the face with a sharp wooden board. The blow shatters Amafo’s glasses so that one lens looks like a spiderweb. It also cuts his cheek severely and knocks him down, stunned. He can stand only with the help of two people. With his granddaughter’s shoulder as support, he walks back to their horse and wagon, dazed and bleeding. I saw Amafo bide his time, allowing one argument after another to fizzle and die. He already knows what he’s going to do, I realized. He will wait all night if he has to, till everyone else has burned themselves out, before he tells us what he’s thinking. In the small hours of the morning, after all the violent proposals have been made and allowed to “fizzle,” Amafo speaks to the gathering. He says that the white people in Spiro will be talking for weeks about how the Marshall struck Amafo. He says that, if he stays away from the town from then on, the whites will forget what happened, even though the Choctaws never will. They will talk after you leave. They will tell stories about today… Everyone will talk about Marshal Hardwicke. And when the talk dies down, I will always be there, wearing my spiderweb glasses. Throughout Tim’s novels, there are stories like this—where people struggle against the temptation to respond violently to violence, because their violent response would only diminish them. Even in situations where there is no choice but to kill in order to protect the lives of many innocent people, the wise ones among the Choctaws are aware of the cost of violence. It’s always a last resort. It feels like a very natural, visceral response in me, to want to kill those hate-mongers and to hate them back. Tim is helping us understand, though, that acting on such an impulse would only increase the amount of hatred and violence in the world. It would actually diminish us. Is There an Alternative to Hating Back? Tim’s books show us another way: to be as thoughtful as Amafo about how we respond. We can be thoughtful about preserving our authentic selves, about choosing to live out of love, out of nonviolence—not only because hatred and killing are wrong, but also to preserve our essential qualities. Our kindness and lovingness, these stories show us, are so important that we must put them above our fears, above any pull to hatred—above anything that diminishes our true, brave and loving selves. We can and must guard our authenticity, even—especially—when it is threatened by our own sense of justice, outrage, or retribution. * Tingle, Tim. 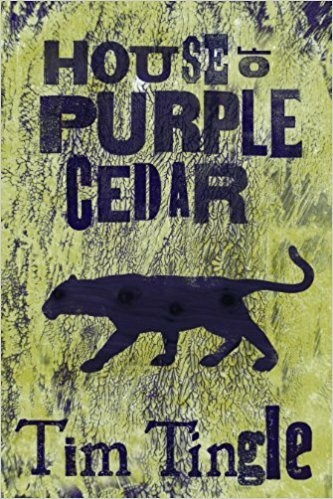 House of Purple Cedar (pp. 45, 65, 66). Cinco Puntos Press. Kindle Edition. Newer PostWhy Aren’t I Getting More Work as a Storyteller?